You probably do not know who the actor Hedy Lamarr was as her last film credit was in 1958. If you ask your parents they may have a vague recollection or at least know her name. What they probably don’t realize is that she wasn’t only an actor. She was a philosopher and, most importantly this month as we remember the World Wars and the sacrifices made during those wars, she was an inventor. She and avant-garde composer George Antheil worked together to create the first broad-spectrum frequency hopping wireless communications. “What on earth is that?”, you’re probably thinking! Well, it’s WiFi. I am sure your parents, or maybe even you, have a smartphone or a tablet or a laptop that you connect to the internet or other network wirelessly. WiFi was developed out of what Hedy figured out back in the ’40s; that if you send a set of signals, in random order on random frequencies, from one device to another, it’s very hard to determine what the next frequency might be. These days, of course, we have so many devices that do this that an ‘extra layer’ of security had to be added in the form of your WiFi password and other measures. But back in the ’40s, this was a new thing. And Hedy and George were the first to realise its potential. So how did an actor figure this out? By watching a player piano and talking to her first husband, Fritz Mandl, Chief Executive of a world-leading arms company. She was included in some of his discussions with various countries about warfare, because she was, I imagine, ‘the little woman’ and ‘couldn’t possibly understand’ what they were talking about, which were common attitudes back then. I’m sure she served many cups of coffee and pieces of cake in order to be included in those meetings. What they were talking about were radio-controlled torpedoes, but they dismissed the idea because they could think of no way to stop the enemy from disrupting the signal. Hedy had the idea to have the signal jump among frequencies in a random pattern. After she left her husband and travelled to America to become a movie star, she met George Antheil. 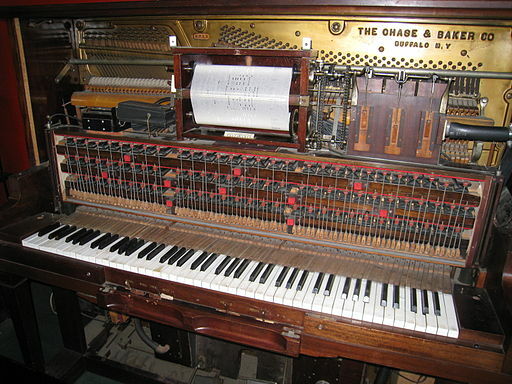 After watching a player piano, which is one that plays by itself by using a roll of paper with holes punched into it, she and George developed the idea to copy the 88 keys on a piano keyboard and using the same paper roll idea to programme the frequency hopper to confused any jamming attempts. In 1942 Lamarr and Antheil were granted a patent by the US Patent office and they immediately placed the patent and the device at the disposal of the US military. Unfortunately, the US military didn’t actually use the technology until 1962 and the Cuban Missile Crisis, although they did try it out in the 1950s as a way to detect submarines from airplanes. So an actor, with no formal engineering training, met up with a composer, also with no formal engineering training, and by looking at the world around them invented what we know today as WiFi. So take a look around. Do you see anything that might be adapted to become something else? The world isn’t getting any easier. With all these new inventions I believe that people are hurried more and pushed more… The hurried way is not the right way; you need time for everything – time to work, time to play, time to rest. “My son, Adam Jacob, was born in June 2009.He’s the greatest thing I have ever done.And the hardest job I’ve ever had is being a Mummy. Tee is what my niece named me when she started to talk. Now half the world calls me Tee. The other half call me Byn. The last half call me Robyn. And I am terrible at maths”. “My son, Adam Jacob, was born in June 2009. He’s the greatest thing I have ever done. And the hardest job I’ve ever had is being a Mummy. Tee is what my niece named me when she started to talk. Now half the world calls me Tee. The other half call me Byn. The last half call me Robyn. And I am terrible at maths”.